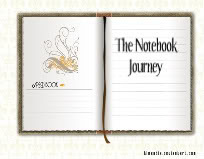 I signed up on the notebook journey. Those who signs up are getting it mailed to them, and then you get to write one page of entry and mail it on to someone else. I can't wait for it to get here, but I guess it will take time. It has now been sent to no 2 on the list, and I know there are at least 72 people on the list.